Bought a unit @ $599 at NTUC Xtra @ Changi Biz Park yesterday, 3 units left. Sold my spoilt 50" Philips FHD at $80 to one of the spoilt tv buyer at Carousell. Got The TCL 55” 4k curved Tv for about 2 weeks now. colors, PQ, and built in speakers quality I must say is quite decent for $800. Speakers are actually much better than my previous 47” LG that went dead suddenly. Color contrast and saturation is best when viewed directly from the front. When I shift my position to the left or right of the sofa, the colors and contrast tend to wash out a little though still decent. True 4k and HDR10, texted with Netflix videos. And streaming speed is decent. Not much lag. both wifi and LAN working well. OS is very simple and not much documentation in the operation manual, took a bit for me to figure out the settings. with its pre-installed YouTube and Netflix it’s good enough for me. just nice complement my android box which I use for other streaming services and watch videos from my NAS. I believe that the TV itself does not have upscaling capability. scaling is done either through my AVR or media player. One very irritating observation is the ARC. Somehow HDMI handshake between the TV and AVR is not “automatic”. I have to turn on my media player first, wait for a while then turn on my AVR followed by the TV. Otherwise the sound from TV doesn’t not play through the AVR. maybe the TV and AVR not fully compatible with one another or could be the fact that I’m using only HDMI 1.4 cable (which actually restricts playback at 4k 60hz). All in all happy with the purchase for such a price. People here talk about AOC and you talk about TCL? Just bought a set of 50" @ $599 NTUC xtra JP. 55" no stock. Left around 6 sets. anyone know if the offer still available at ntuc extra? 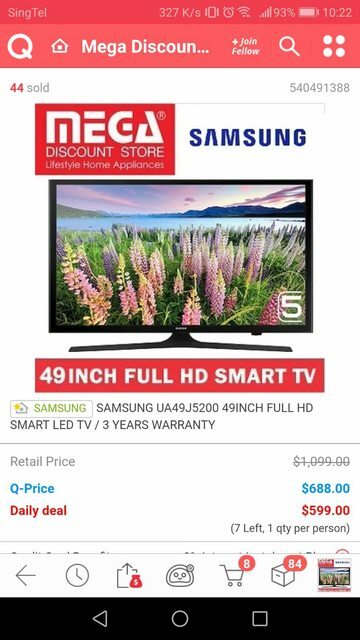 This one worth it as compared to aoc 50inch? I was at NTUC Xtra AMK Hub yesterday and there are stocks for the 50 inch (599) and 55 inch (699). Also, if you can, try to buy some NTUC vouchers from Carousell to offset your purchase. There is one exception, Hi Sense 55" 4K is true 4K, I borrowed a chair to examine the panel (located on the upper racks). Where can view tcl tv ?